I didn’t find a whole lot of typical Romanian vegan food, mind me, but I’ve heard it exists. I did find a profusion of raw vegan restaurants that are riding the healthy living wave and that are as such a little overpriced, but still really delicious in some case. Below are my favorite finds. If you visit any of these, make sure to check the opening hours ahead as it seems vegan people in Romania eat only on weekdays! Wondering where to stay and what to do in Bucharest? 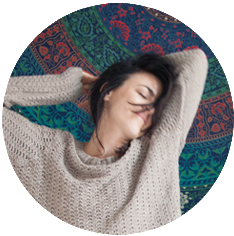 check out my guide here! 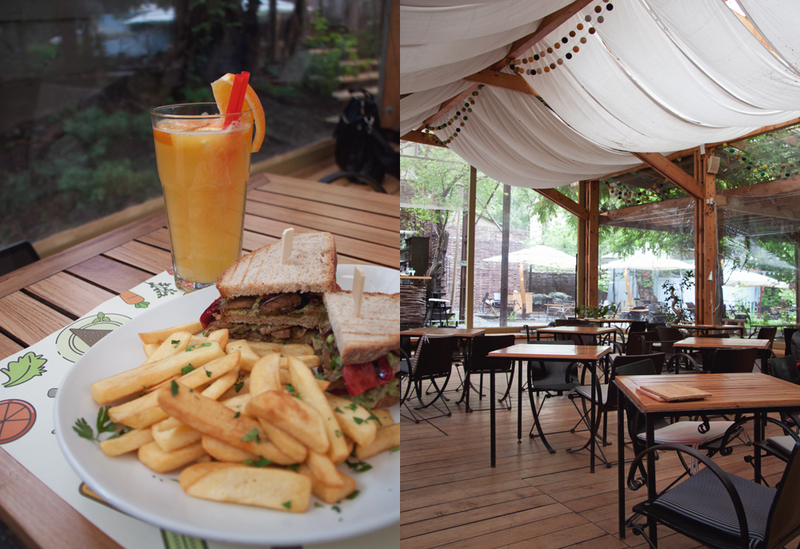 The most varied fully vegan restaurant in Bucharest that isn’t only just raw. Barca is also the only restaurant I found to offer dishes that are typically Romanian, such as a vegan tripe soup. Barca has the most horrible decor and ambiance (talking to you, 80’s music radio and stained carpet…), but don’t let that deter you as the food is great. Watch out for the use of honey in several drinks and desserts (an unfortunate recurring theme in Bucharest). They have a great selection of juices and smoothies and a huge menu of cooked and uncooked food of all sorts. I went for the house platter to have a little sample of everything. It was a mix of sushi, pates, crackers, tabouli, etc. Super yummy! 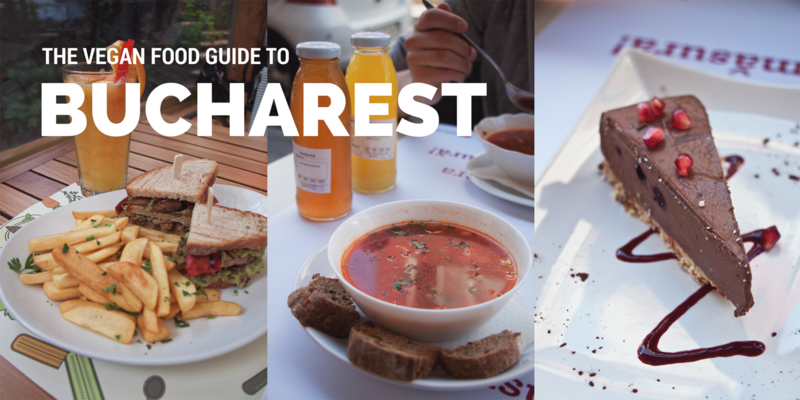 TIP: Pair this with a visit to the wonderful Herăstrău Park. If the weather is nice, get a rowing boat for €1 per hour! A lovely cafe that reminded me a bit of Ubud’s secret gardens, with several vegan options (a few more at lunch than at dinner), amazing lemonades and a bitching avocado club sandwich. Anywhere that serves straight up ginger juice is a winner in my book. TIP: Come here to soak up the atmosphere and chill for several hours, and don’t forget to check out the bookstore next door and the street art on Strada Pictor Arthur Verona! This is tourist central, so you will likely pass this place a gazillion times, or you might just straight up miss it walking through all the hustle of the old town. Although not Romanian whatsoever, it’s a lovely place filled with veggies and hummus and tahini. 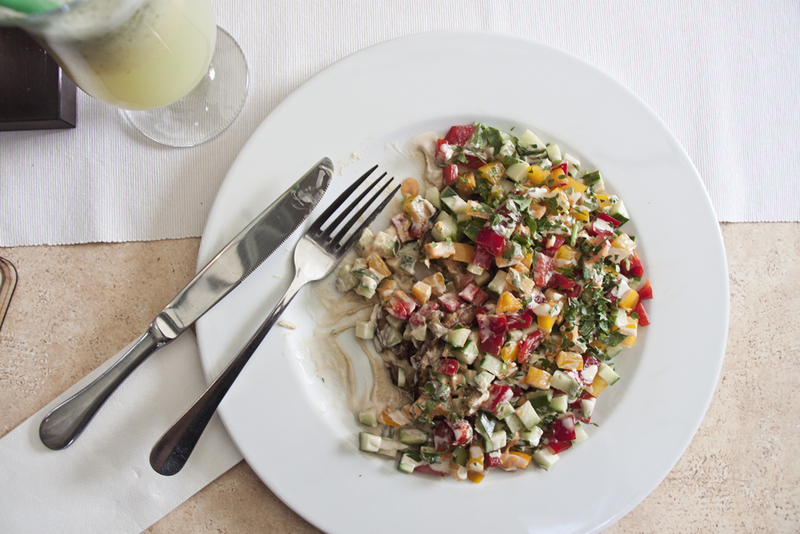 There’s a full vegan menu with things such as couscous salad with mango and pomegranate, falafels, or roasted eggplant with raw veggies on a bed of tahini. Delicious! TIP: You’re in tourist central. Explore the surrounding thoroughly! 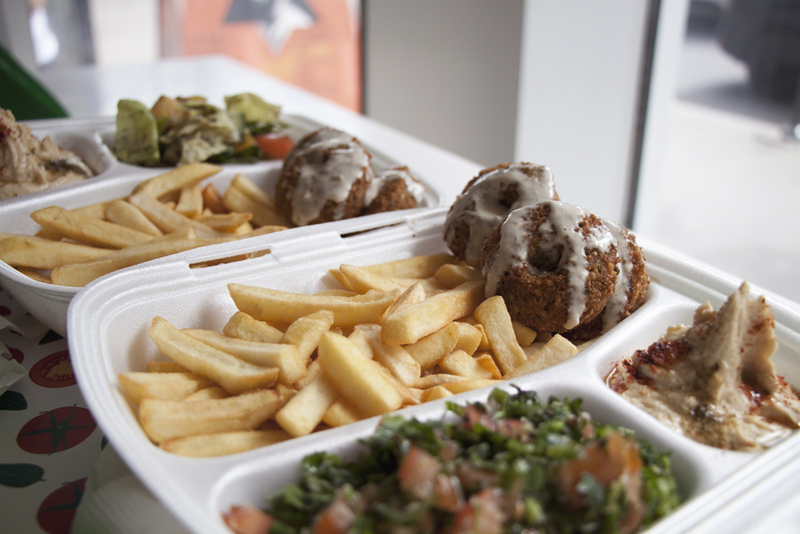 One of the very few fully vegan cooked restaurants in town, this one specializes in falafels, and by golly does it very well. There are a couple of delicious soups each day to pick from and a few falafel variations, so you really can’t go wrong here. Fast and delicious! TIP: Once you’ve filled up on falafel, keep walking on Bulevardul Nicolae Bălcescu until you reach the National Theatre. Did you know this was the third iteration of its facade? Another disturbing manifestation of Ceauşescu’s megalomania. Rawdia is in a quiet neighborhood and there isn’t much around, so make sure you check the opening hours because you won’t have much else to do there. 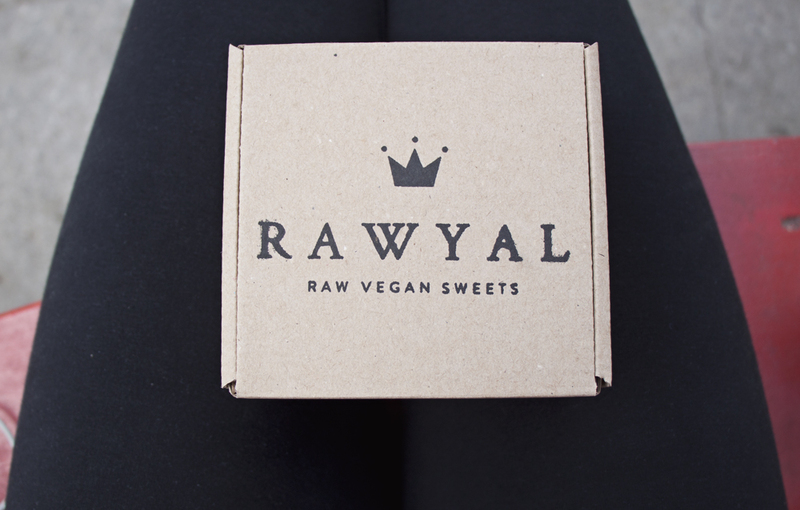 Rawdia is, as the name suggests, mostly raw vegan with a cooked soup on the daily menu. Look out for honey in desserts here again. They brew their own kombucha and are extremely friendly. Take away available. TIP: Save room for RawCoco right next door! 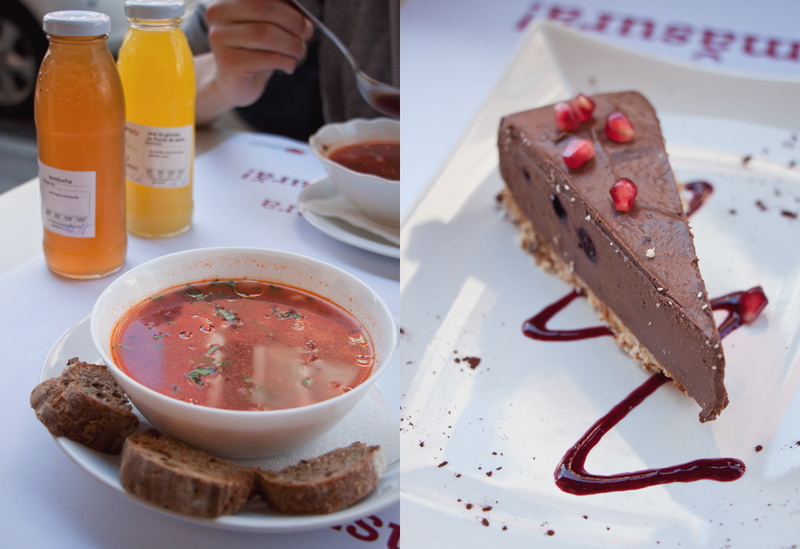 For some reason, Bucharest has many many outlets for raw vegan cakes. This one was my favorite one because of the proximity to another vegan restaurant and the lovely sit down area. They also have a lunch menu and detox program, but I didn’t try any of that. I only sampledra a variety of deliciously heavy (read: they contain a lot of nuts and coconut oil!) raw vegan cake. TIP: This isn’t the most exciting neighborhood, but it’s quite lovely to walk around the residential area and check out the amazing houses. This was a bit confusing to visit because I was told it wasn’t a sit-down restaurant despite the fact that… well, it sure looked like one. It’s totally worth a visit to grab a takeaway because they have really delicious food – the supa de cocos was incredible! 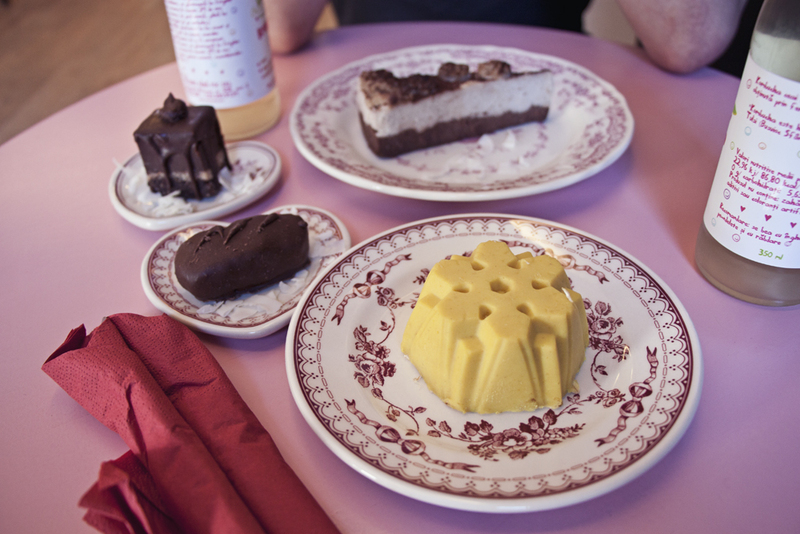 They also have a big selection of tiny little raw vegan cake bites which are super cute. This is on the pricier end of things for what it is, but it’s really good. TIP: Since there isn’t much around and they offer delivery, I’d recommend doing that. A little hidden gem in a quiet neighborhood, Rawmazing is literally hidden. It’s really hard to find! 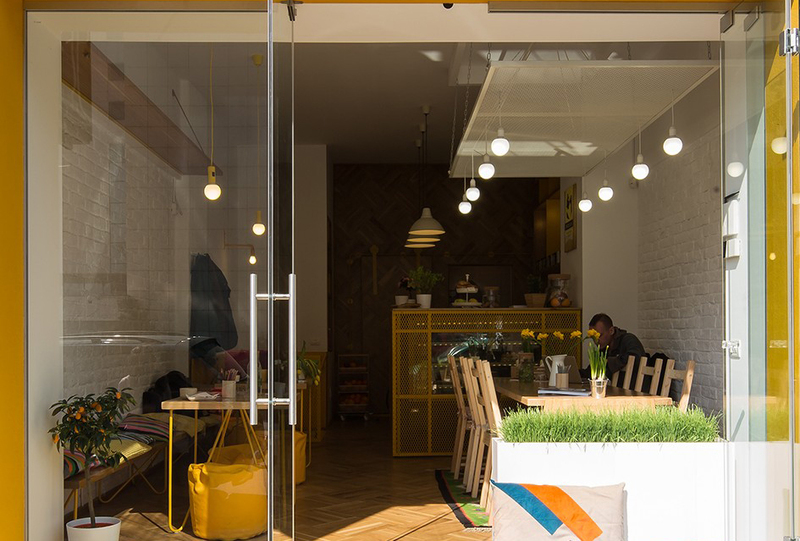 Once you find it though, it’s a quiet spot to munch on quality raw vegan dishes such as pizza, wraps, sushi and desserts. 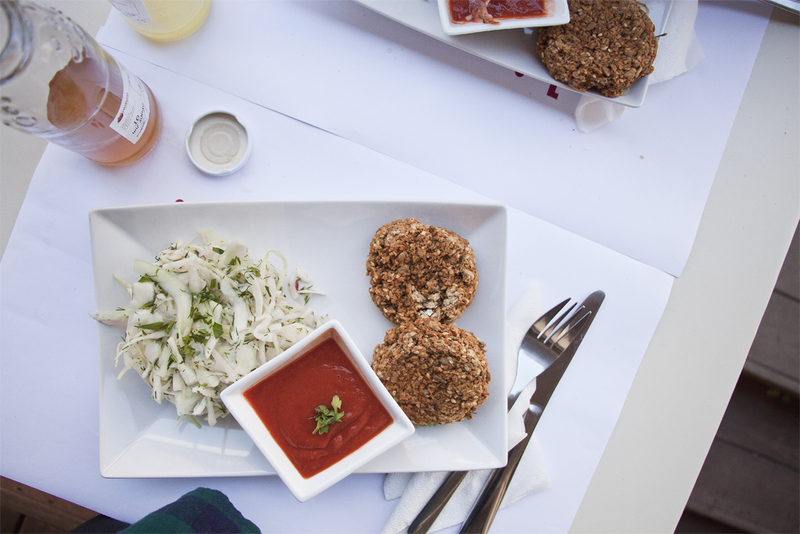 The raw vegan set lunch menu is the best option if you want to sample some of their great dishes. VegUp might seem far on the map, but it’s located minutes from the Aurel Vlaicu Metro Station so it’s easily accessible from the city center. 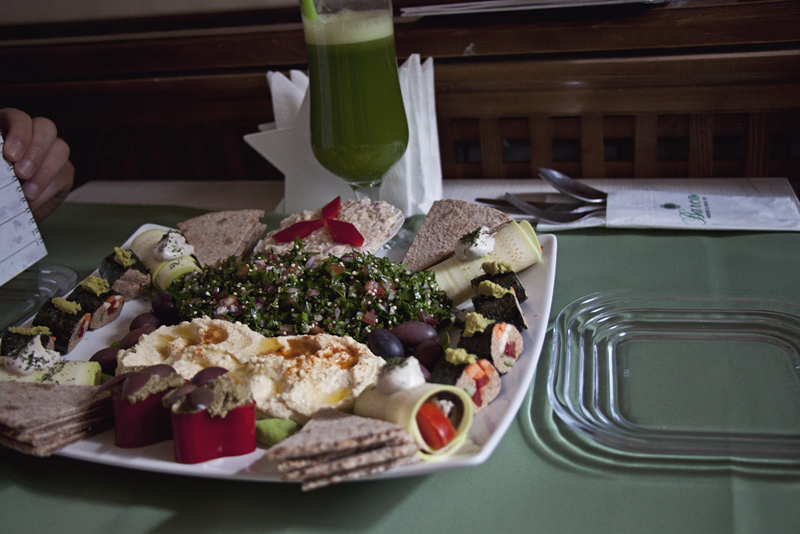 They serve no-frill, healthy, vegan and vegetarian food at a very reasonable price. 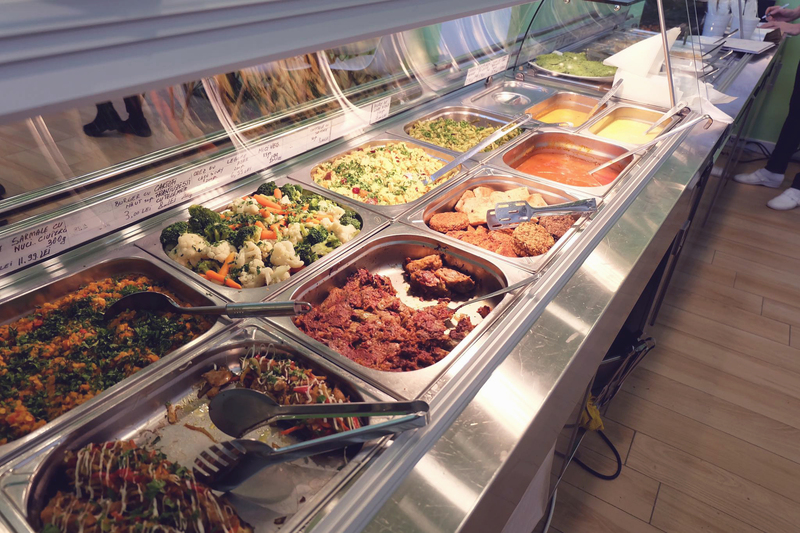 The vast majority is vegan and you’ll find a huge selection of salads, soups, mock meat, desserts and what have you. TIP: Come hungry, it’s a gigantic menu and you’ll want to sample everything! Arome is one of the newer uber hip and cool restaurants in town. They offer a fully vegetarian menu with several vegan options. The sweet potato soup and the avocado sandwich are fab and the coffee is delicious. A beautiful space where you’ll to linger forever. Many thanks to Experience Bucharest, Open Doors Travel, Romanian Friend, Hotel Mercure City Center, Roaring Romania, and all the wonderful partners and volunteers who made it possible for me to explore this exciting, vibrant and just amazingly cool city. ohh all of these meals look amazing. And they are all vegan, that is a plus. I would love to try the falafel. Oh what a shame! It seems Google updated Verona’s location because that’s how I got there. And yeah, Arome is less than I year old I think. Bucharest is popping!! Omg all this food is making me hungry! I like how there are so many vegan options too. I haven’t been to Bucharest so I’m not familiar with their food. But I’m glad I read your blog as it gives me an idea. Thanks for sharing all the photos of these delicious food! I haven’t been to Romania, and you can be sure that if I do, I will be visiting these restaurants! The Rawdia looks like the most amazing food. Maybe it’s the chocolate pie that’s there but it looks so yummy. Vegup and Rawmazing are my first choice. I don’t care if they are hard to find, I will find them! Their food looks so scrumptious! Wish I could go and fly out to Bucharest ASAP. I had no idea Bucharest had so many amazing vegan options. It’s amazing how many great food optiosn exist in Romania these days. Oh wow, I wish I could visit Bucharest soon! The food looks delicious and I bet its fairly easy to find vegan meals or appetizers there! All these dishes look amazing! I’ve never been to Bucharest but I’d love to visit one day! BUCHAREST looks like an amazing place to visit. The food scene looks amazing and it appears that you will be able to find what you are looking for as a vegan. I’m not vegan but I’d enjoy everything you wrote about. Nice pictures to make everything look so appetizing. Really enjoyed this post. Oh wow, all of these restaurants sound amazing! My daughter is not full vegan but she is vegetarian so when we do travel knowing good places to go is important! All of these places look absolutely amazing and the photos make me hungry! Never tried a vegan dish but this makes me want to! Oh wow! 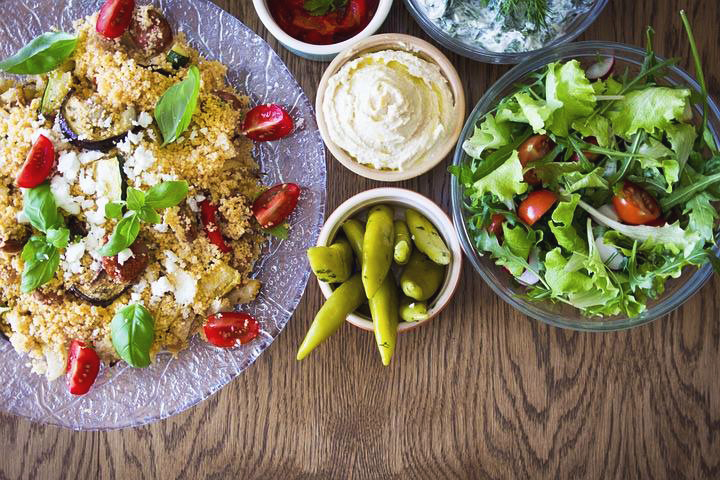 All the meals look amazing and your photos are so drool-worthy! I don’t usually eat vegan dishes but now I want to! I am not a vegan, but I have to say that all of this food looks amazing! I would love to try some! This is a great list of restaurants in Bucharest. It is hard to find vegan food in so many places now days but they do exist. Thanks for sharing the guide. Wow! These meals look amazing! I think I might venture into raw eating a little for all its healthy aspects. Luckily, Bucharest ha some nice alternatives for vegans when it comes to resturants, which can become a problem in other Romanian cities, where there’s usually just one or two vegan dishes on a restaurant’s menu. You’re lucky to have found them, Amelie! Like I told you – you can find plenty of vegetarian dishes in Romania. Vegan food? not so much, so you have to look for specific places. While in other major cities you will find 1-2 spots, visiting the countryside & finding vegan food might be more difficult. Could you please share how much more or less did you spend in these restaurants? Very nice article; however if you ever quit being a vegan i would recommend a once in a lifetime Vampire Manhood (this is not a joke -they have it in the menu) at Hunter Prince – Dracula Restaurant in Turda, Transylvania.